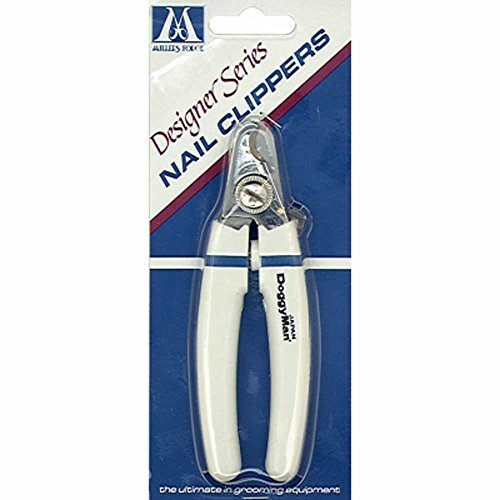 Durable plier-style nail clippers must-have for every groomer. Specially designed 5-inch nail clipper from Millers Forge is ideal for use on dogs and cats. Quality-made of stainless steel to stand up to years of use. Clippers feature comfortable grips and a spring-loaded mechanism for more positive cutting action. Perfect for reselling to customers for at-home maintenance. Lightweight clippers feature heavy-duty stainless steel blades and injection-molded handles to reduce hand fatigue. Lock allows the clippers to be stored in the closed position. It is the famous Doggy Man clippers, with the distinctive white with blue stripe design. Measures 5-inch length. QuickFinder Medium Dog Nail Clipper for dogs up to 75 lbs.